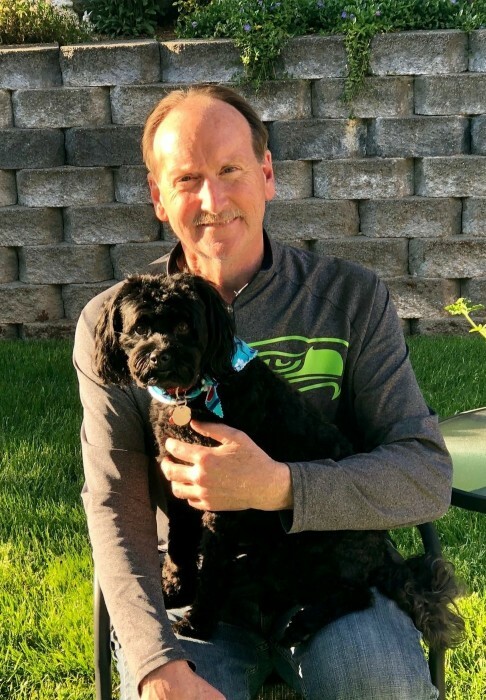 Roger Wayne Jones of Maple Valley, WA passed away at home on August 16, 2018 at the age of 61 after a 4 year battle with cancer. Roger was born on September 14, 1956. He grew up in Blakely Manor and Normandy Park attending Sunnydale Elementary, Normandy Park Elementary, Sylvester Junior High and graduating from Highline High School in Burien. His early years were spent adventuring in the outdoors while hiking or skiing at the Mountaineers Lodge with his family. Much of his free time in the summer was spent enjoying the cabin on Lake Tapps and playing with his cousins. He loved to waterski, swim, and dive. In high school he played tennis and was on the diving team. He was active in his church youth group. Roger married his wife Susan M. Jones on June 12, 1976. They began dating in high school and were married 42 years. Early on they lived in the same neighborhood and attended the same kindergarten. Roger loved Sue well over their 42 years together. He brought her coffee in bed each morning and always pumped her gas. He is survived by his beloved children, Jason and wife Megan, grandchildren Alia, Gavin, Hudson, Merrick and Sawyer, Ryan and his wife Hannah, grandchildren Laine and Paxton, and Brandon and wife Kasey and grandchild Keller. They were the joy of his life. Favorite activities with the grandchildren included getting the mail, listening for frogs, going to the park, hiking, playing in the lake, skiing, sledding, and watching sports. Roger had a sweet tooth and could always be counted on to sneak the grandkids Gobstoppers or other treats. Roger loved the outdoors, hiking, skiing, swimming, bicycling, running and was always ready for an adventure. He passed this love for the outdoors on to his three boys. One of his goals was to summit Mt. Rainier and made three attempts only to be turned away near the top each time due to weather. He enjoyed people and relationships. He loved Jesus and served Him well over the years through Young Life, BSF, church, Kent Hope and many other places. Some of his most enjoyable times were spent being the garbage man at Malibu or tour hosting at the Washington Family Ranch. He always preferred whatever service that could be done behind the scenes. He was a man of integrity, doing the right thing even if it was difficult. While Roger was quiet, he was one of the best persons to have a conversation with as he listened intently and asked questions. He made his family and friends feel valued as he remembered small details. Roger loved his family and friends fiercely, and while he was a man of few words, they knew of his deep love for them.